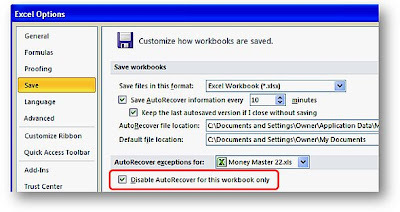 In Excel 2007 and 2010, there is a feature called AutoRecover that saves your open workbooks at regular intervals. In the event of a power failure or computer crash or freeze up, this can help you recover your unsaved work. This feature is turned on by default and is hardly noticeable as it happens in the background. However, you may notice AutoRecover saving files, and may even get annoyed by it, if you have one or more large workbooks open, as it could tie you up for 5 to 10 or more seconds. I often have very large workbooks open that contain only reference information (i.e. files that I'm not making changes to) and other workbooks which I don't require to be saved by the AutoRecover feature. 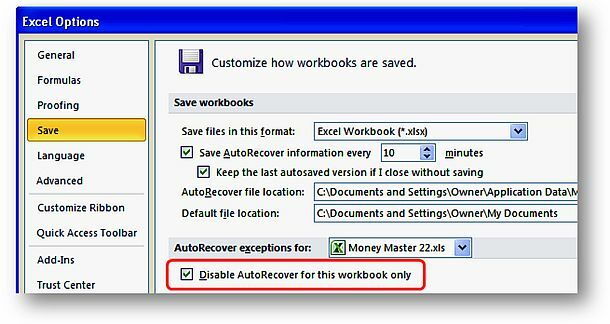 To avoid the unnecessary saving of these files, there is an option available to turn off AutoRecover for individual workbooks. 4) In the 'AutoRecover exceptions for' section, check the 'Disable AutoRecover for this workbook only' option.